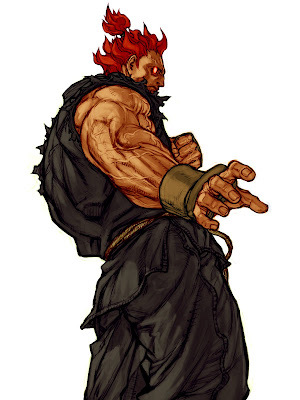 Akuma is the "big bad" of the Street fighter series. Just when I thought M. Bison was the most evil Akuma comes out. The thing that is really creepy is that he is very similar to Ryu and Ken. I'm not sure if he is supposed to be his teacher or fellow rival. I have found a few versions of him for MUGEN. In Japan, he is also known as Gouki. Here is the demo video I made. Akuma is the big bad dude who killed Ken and Ryu's master, Goken. at least i thought so until Street Fighter 4 came out and they had Goken in it. Goken and Akuma trained together when they were young (like Ryu and Ken).Then Akuma gave into the massive power of the Darkhado and killed they're trainer (i think that's where he got the huge beaded necklace). It's also been hinted that Akuma is Ryu's father.